It comes as a surprise to many people that we almost always paint all new pottery for our (often elaborate) window displays. Since we change our windows four times a year, you can imagine the amount of creative energy it can take! To make the process go more smoothly, we employ many of the time-saving techniques (also known as cheater tricks) that we love to share with you, our customers. The theme for the window we're working on right now is "Painted Weddings," and it's going to be filled with all of the wonderful things that can be painted for a wedding. This includes everything from centerpieces and sign-in platters to gifts for your wedding party. One of the designs we're using throughout the window is something that has been super popular with our customers lately--chevron! 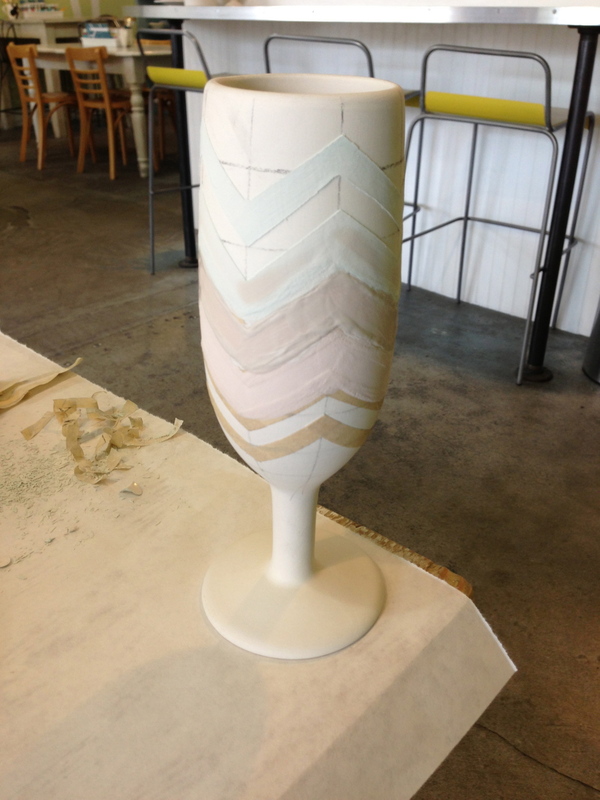 So in the spirit of always sharing our cheater tricks, here is a tutorial I put together while painting the stunning (if I do say so myself) ombre chevron champagne flute pictured above. Using a No. 2 pencil and a ruler, I drew a grid all the way around the flute. To get the spacing even, it helps to look down on it from the top and mark off 8 sections, just like you're cutting a pizza. Using the intersections on the grid to line up the corners, I put masking tape on the flute in a chevron pattern. After all the tape was on, I used a small rotary cutter (exacto knives work too) to cut off the torn off edges of the tape and make the points of my chevrons nice and sharp. 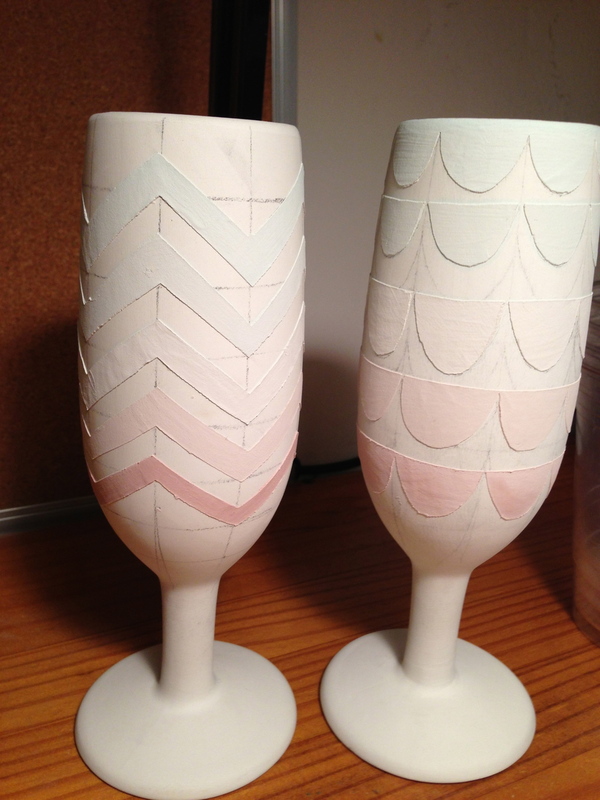 Behind the goblet, the two square vases show what the tape looks like before the razor blade. Putting a sharp knife to the ceramic scores it a little bit, but I've found that the glaze fills it in. I mixed 5 different shades of pink to make mine ombre, but it would also look nice all one color. The image to the right shows mine halfway through the painting process, with some of the tape already removed, and below it's all painted and waiting for a trip to the kiln. Doesn't sound too bad, eh? I can't say exactly how long the chevron flute took start to finish, as I was working on the matching scalloped flute and the two square vases at the same time. With so much painting to do, multitasking is important! Make sure you swing by and have a look at "Painted Weddings," coming soon to our storefront window!